Windows are available for envelopes #9 and #10 only. When you own and operate a business, you need to establish brand recognition. 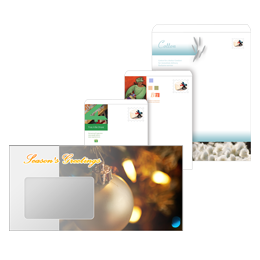 If you print custom envelopes, you can incorporate your company logo and other identifiers on your stationery. When you hire Printsafari.com custom envelope printing services, we can create a unified look to your business cards, letterhead and envelopes. Let us create custom envelopes that will earn name recognition for your business. Printsafari.com online envelopes printing service offers a world class product and a fast turnaround on your order. Our custom envelope printing services will work from your art when we print custom envelopes for you. When you utilize our online envelopes printing service, you will be pleased that we print custom envelopes on 70 pound paper. We also use the best quality inks when we print custom envelopes for your business. Your mail will get noticed when you hire Printsafari.com for all your custom envelope printing services. Be advised that not all custom envelope printing services are created equal. Some use inferior paper and inks. If you want your business to show its classy reputation, let us do your online envelopes printing for you. When you hire Printsafari.com to do your online envelopes printing, you will be proud of the way we make you look. We can print custom envelopes in a variety of sizes to suit all your business needs. When you want an online envelopes printing service you can trust, contact Printsafari.com.